This week’s minorities in cartoons entry is “Questionable Content,” a webcomic by Jeph Jacques. The strip began running in August 2003, and has since become one of the more prominent webcomics. “Questionable Content” is a “slice-of-life” strip about the lives of a group of mostly twentysomething friends, lovers, and so forth. Per Wikipedia, the strip’s set in Massachusetts, though in a “twenty minutes into the future” setting where commercial space stations, artificial intelligence, and robots are commonplace. Marten, a library assistant who’s interested in indie rock. Pintsize, Martin’s small-sized “AnthroPC” robot. Tends to make crude jokes, misbehave, and serves as comic relief, but he does like Marten. Faye, Marten’s roommate. A former coffee shop employee, she’s now working in robotics. 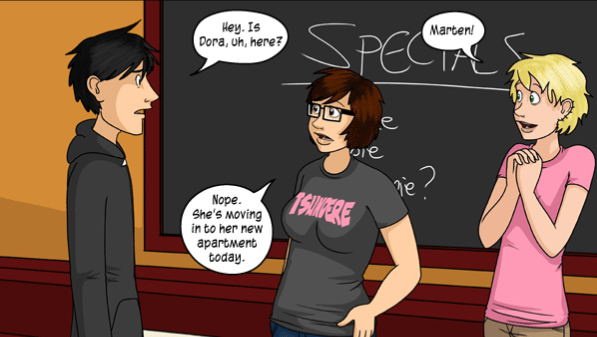 Dora, a former girlfriend of Marten, as well as bisexual and an ex-goth. The proprietor of the Coffee of Doom coffee shop. Hannelore, an eccentric employee at Coffee of Doom. She’s also Martin and Faye’s neighbor. Claire, a transgender woman who works at the local library as an intern. She’s also started dating Marten. Clinton, Claire’s more reserved-acting younger brother. He’s a fan of Hannelore’s father, a scientist behind much of the artificial intelligence present in the strip’s world. The cast is quite large, as I’ve noted earlier. A fairly diverse group of LGBT individuals are also present in the strip. Marten’s father runs a gay nightclub in Miami (and got married in one storyline).